MANAMA, 30th October, 2018 (WAM) -- Prince Khalifa bin Salman Al Khalifa, the Prime Minister of Bahrain, received H.H. Sheikh Abdullah bin Zayed Al Nahyan, UAE Minister of Foreign Affairs and International Cooperation, with the attendance of Noura bint Mohammed Al Kaabi, Minister of Culture and Knowledge Development, as part of their visit to Bahrain to attend the meeting of the Joint Supreme Committee between the UAE and Bahrain. 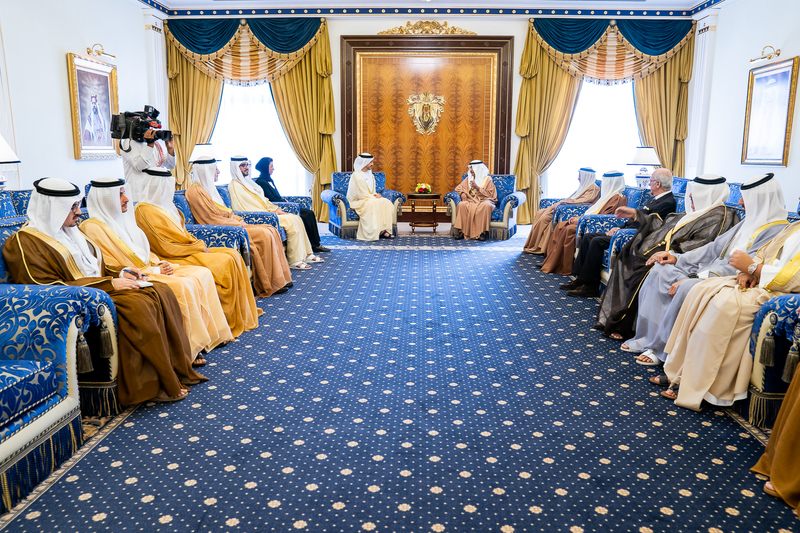 Prince Khalifa stressed that the UAE’s support for Bahrain will be immortalised in his nation’s history, as it reflects the true meaning of brotherliness and cohesion between two countries that are brought together by love, synergy and common destiny and goals. He also affirmed that the UAE’s actions, under the leadership of President His Highness Sheikh Khalifa bin Zayed, are based on a historic legacy established by the late Sheikh Zayed bin Sultan Al Nahyan, which his sons are still following and is distinguished by the relations between the two countries. Prince Khalifa congratulated the UAE’s President, government and people on the successful launch of "KhalifaSat," while describing it as an international accomplishment that makes every Gulf and Arab national proud. Prince Khalifa stated that successive Emirati accomplishments in the various development and scientific areas reflect its overall approach, which deserves to be a model to follow, benefits other Arab and Gulf countries, and helps to create a brighter future. 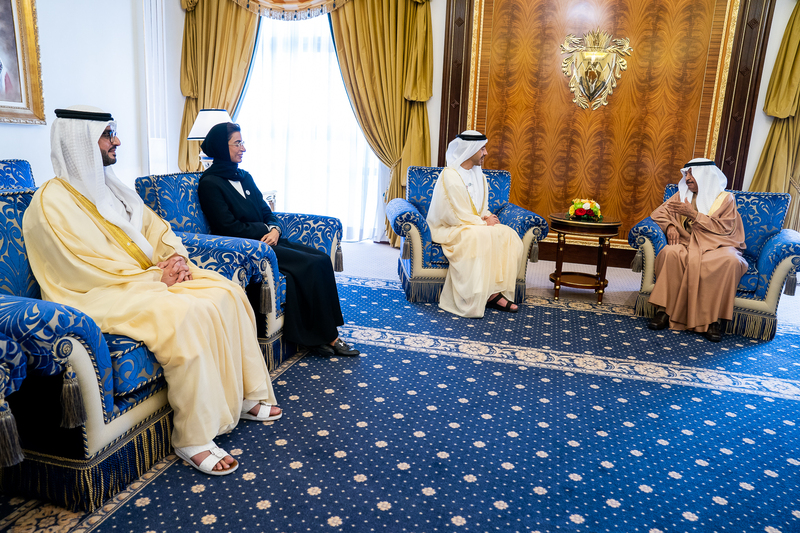 Prince Khalifa thanked the UAE for supporting Bahrain in various issues while affirming that its unlimited actions are not unusual and will always be honoured and appreciated by the people of Bahrain. Prince Khalifa stressed that the meeting of the committee has gained significant importance in terms of its timing, as it will enhance the cooperation between the two countries and serve their joint interests. During the meeting, Prince Khalifa highlighted Bahrain’s efforts to improve its bilateral, Gulf, Arab and international cooperation, as well as its coordination with the UAE. 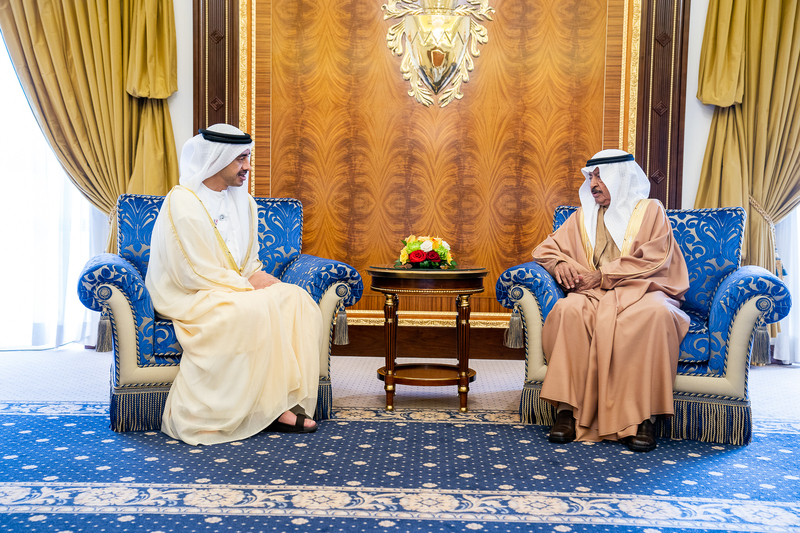 Sheikh Abdullah praised the historic relations between the two countries, as well as the efforts of the Government of Bahrain, led by Prince Khalifa, to improve them in all areas. "Our relationship with Bahrain is historic and is based on deep ties and joint interests, most notably on the love and trust between our countries, leadership and peoples," Sheikh Abdullah said. Sheikh Abdullah highlighted the UAE’s efforts to support Bahrain while pointing out that the UAE is happy with Bahrain’s accomplishments and development, which reflect its ability to confront its challenges and difficulties. Sheikh Abdullah endorsed the vision and invitation of Prince Khalifa to intensify the visits between officials from both countries and other Gulf countries. The meeting was attended by Sheikh Khalid bin Ahmed Al Khalifa, Minister of Foreign Affairs of Bahrain; Sheikh Sultan bin Hamdan bin Zayed Al Nahyan, UAE Ambassador to Bahrain; Mohammed Sharaf Al Hashemi, Assistant Minister of Foreign Affairs and International Cooperation for Economic and Commercial Affairs, and Ahmed Ali Al Balooshi, Director of the Gulf Cooperation Council, GCC, Affairs Department at the Ministry of Foreign Affairs and International Cooperation.